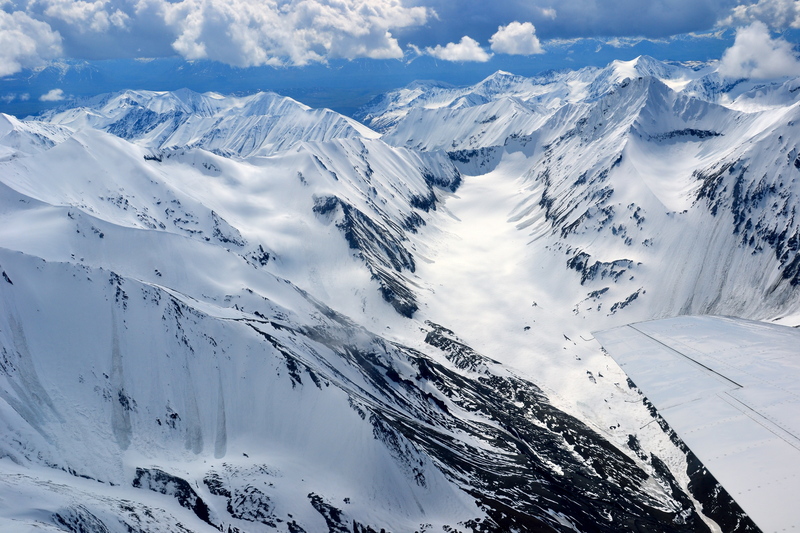 “Tree line is at 3,000 feet,” said our pilot, Dan. 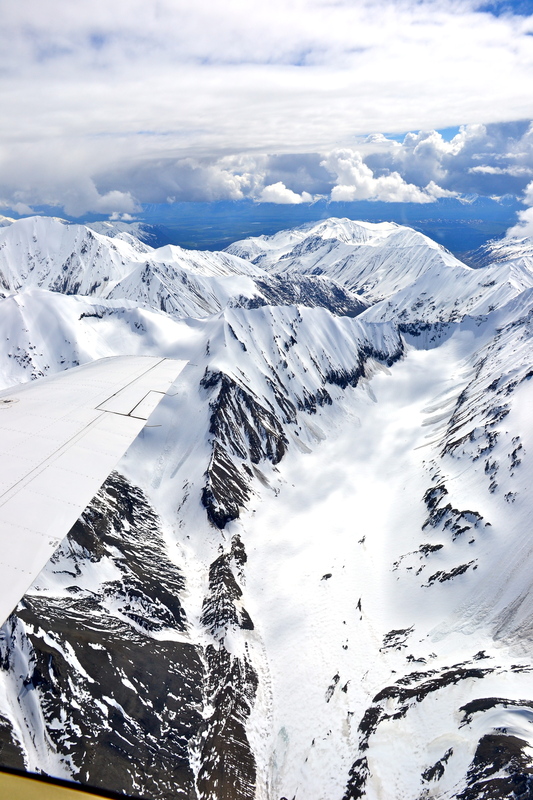 “Above 7,000 feet there’s just rock and snow.” We had just taken off in a little 8-seater plane for a fly-by of Mt. 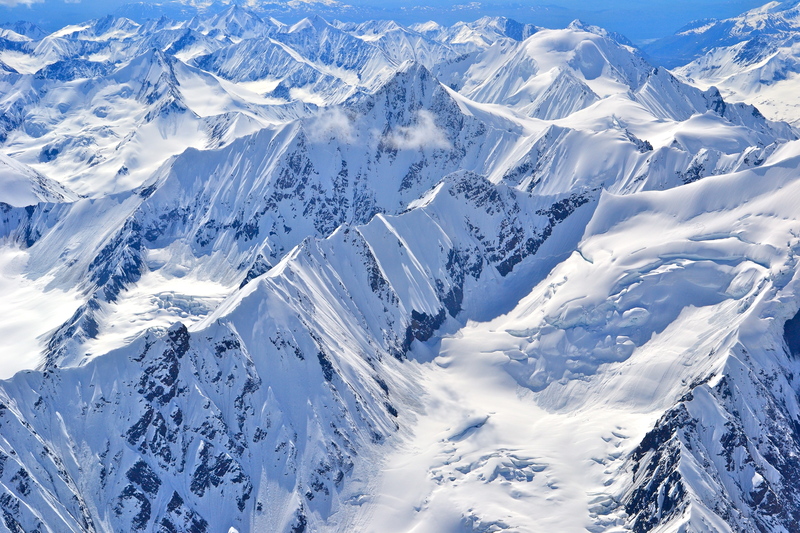 McKinley, the highest point on the North American continent, and Dan was already sharing his comprehensive knowledge of the mountain geography, naming rivers, glaciers and mountains as we skimmed over snow-capped peaks on a bee-line for Denali. 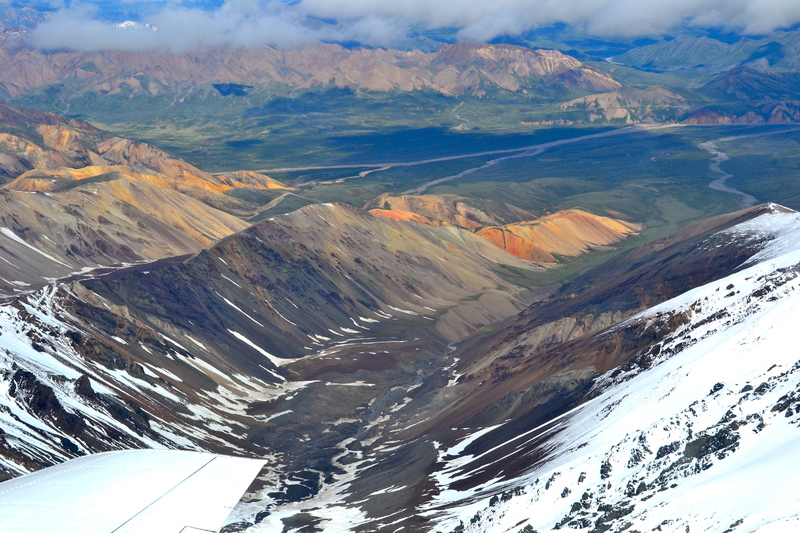 An aerial view of the Polychrome Mountains also reveals a distant glimpse of the Parks Highway skirting the other side of the valley. At first there was a lot of color as we climbed out of the dark green forest, but before long there was only snow and rocky cliffs, sure enough. 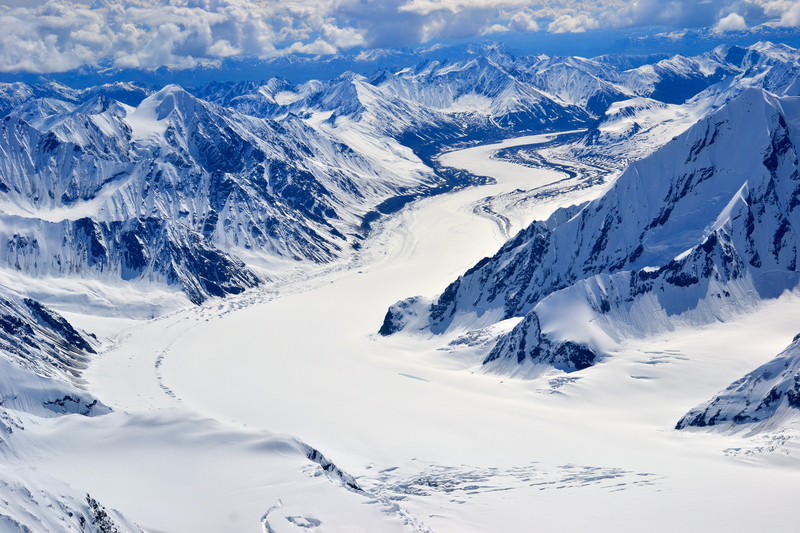 There were glaciers by the dozen, some of them perched in hanging valleys, others stretching into the distance like long wide rivers of ice. Our flight took us delightfully close to the jagged peaks as Dan zig-zagged his way between spires and pinnacles all along the way. 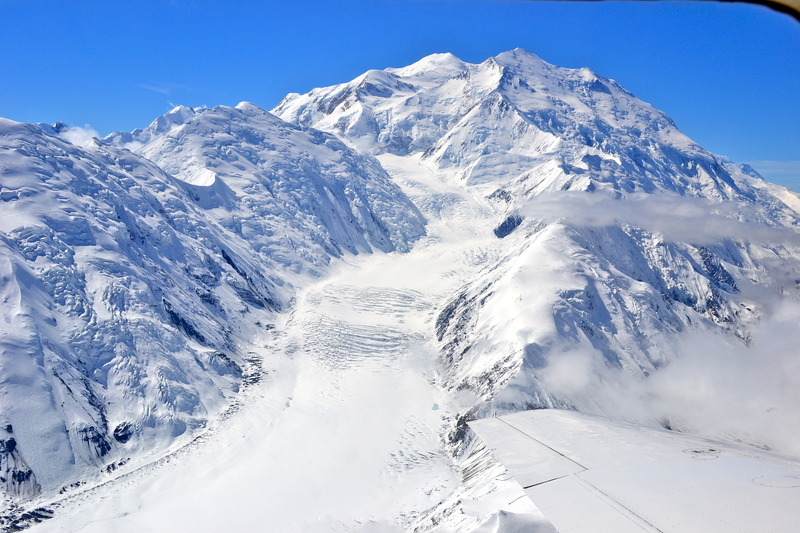 We soon reached Mount McKinley itself, a huge, disorganized heap of rock with all sorts of cliffs and mounds facing in all directions and several glaciers oozing from its high canyons and valleys. Pretty soon we made a wide banking turn over a massive glacier and headed back through the dizzying maze of peaks as Dan pointed out a trail across a snow field left by the last team of climbers on the mountain. 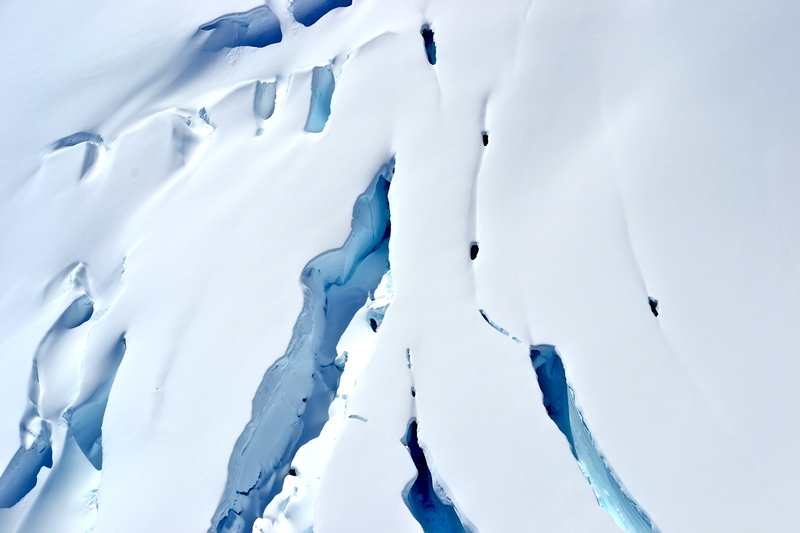 I wondered how they knew where it was safe to cross; I was seeing dozens of crevasses from the air. Eldridge glacier is 35 miles long and hundreds of feet thick. 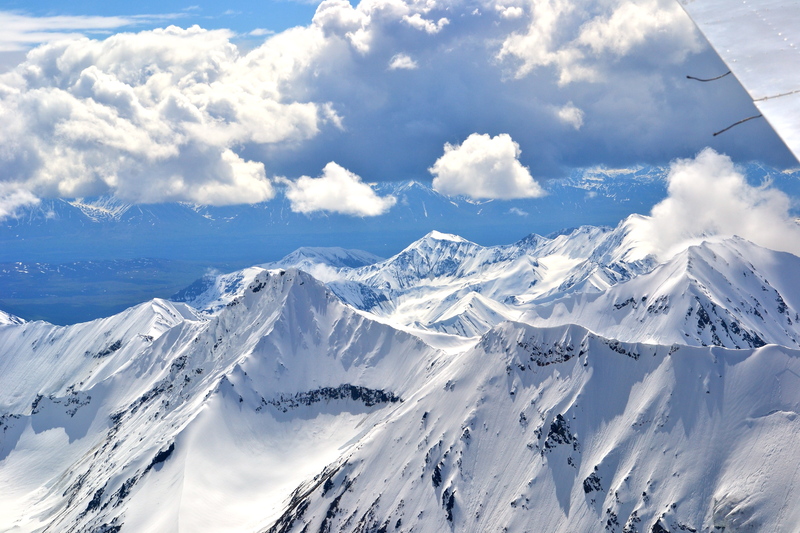 This flight to the Mountain was certainly the pinnacle of my Alaska experience. We are just about halfway through our summer in the land of the midnight sun and realizing that it is such a vast area that we will not get to see everything; there is just no way. Seeing it from the air certainly covers a lot of territory in a short time. Maybe I’ll get to catch another flight around the Mountain before my time is up here. What a natural high! 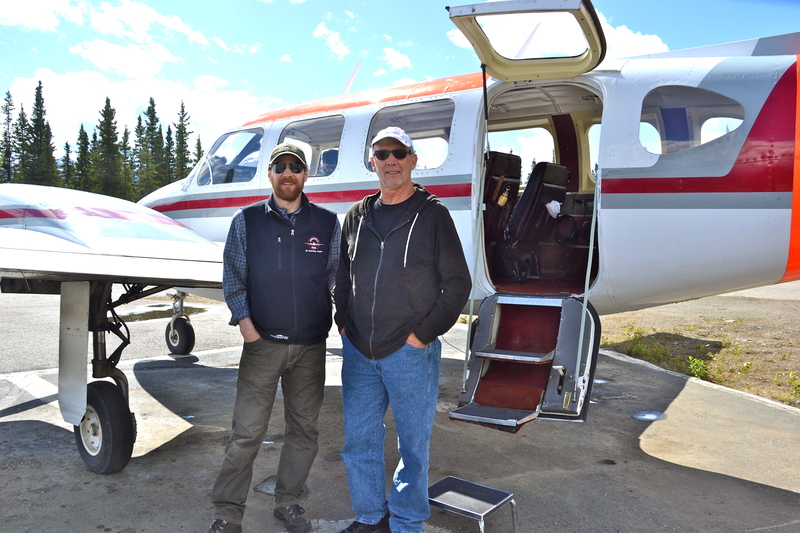 Dan does a great job as pilot and owner of the flight-seeing company, Denali Air. 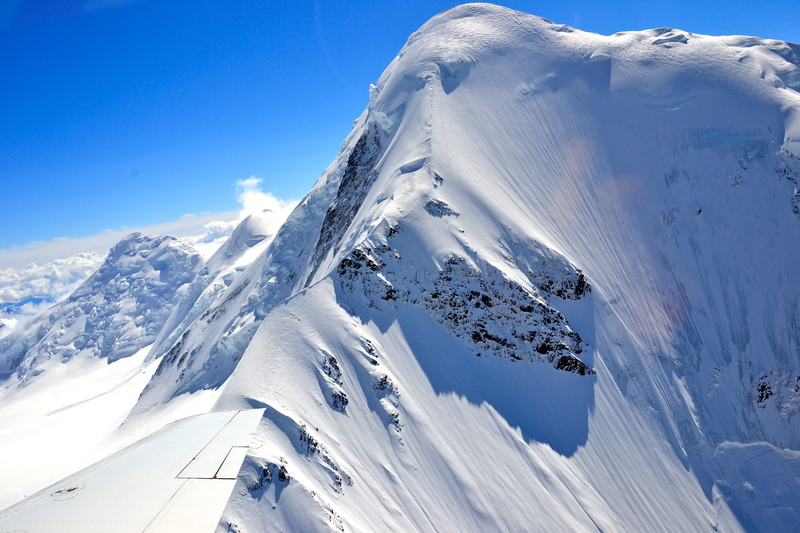 My flight was arranged by my son-in-law, Scott, the owner of Denali Adventure Tours. It’s just one of many adventure trips they provide.